The purpose of the Delaware 8 Concept Plan and Operations Study is to create a corridor plan that can be used by the City of Dover and the Delaware Department of Transportation to guide transportation investments in the Delaware Route 8 corridor in the years to come. The study area extends from the Norfolk Southern railroad tracks in the City of Dover to Artis Drive west of the city limits. The study is being conducted by the consulting firm, Johnson, Mirmiran and Thompson, with input from the Project Advisory Committee. The study began in September 2006 and is expected to be completed by September of 2007. This web page is being provided to help concerned citizens follow the progress of the study. If you have any questions, please contact Juanita Wieczoreck, Executive Director of the Dover/Kent County MPO at (302) 760-2713. The final report for the DE 8 Concept Plan and Operations Study was published in May 2008. Read the description of the work being performed by Johnson, Mirmiran and Thompson (JMT). One important task in creating the concept plan for DE 8 is getting public comments and suggestions. The first public workshop was held at William Henry Middle School on February 21, 2007, from 4:00 to 7:00 pm. About 20 people attended the workshop to review the work completed by JMT. The following links show the display boards that were viewed at that workshop. These boards showed the traffic volume and accident data that had been collected and analyzed, and suggestions for pedestrian, transit, bicycle and aesthetic improvements that might be made. 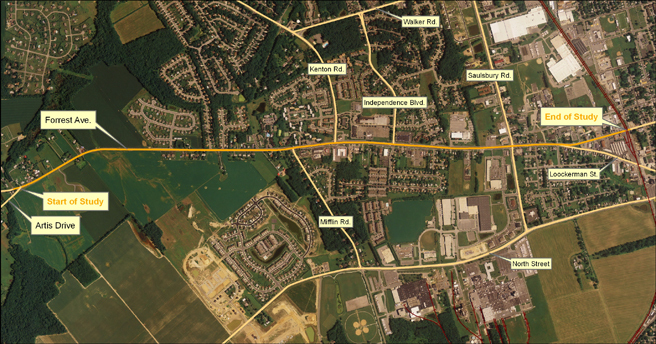 A comment form is also provided that can be completed and returned to the Dover/Kent County MPO. All of these links are provided in .pdf format. Collect Data on existing Landuse, Transportation Conditions including Public Input.